How Safe is an Airport Full Body Scanner? You are here: Home / Cancer Causes / How Safe is an Airport Full Body Scanner? If you’ve traveled through a U.S. airport within the past few years, you’ve probably had a government screener say something along these lines. Every day travelers are herded through the checkpoint corrals into one of these anti-terrorism full body scanners. The Transportation Security Administration (TSA) claims these so-called “advanced imaging technology” devices are just as safe as traditional metal detectors. But is this really true? When they were first rolled out post-911, backscatter X-ray tunnels quickly became standard fare at commercial aviation facilities nationwide. The TSA claimed the amount of low-intensity radiation emitted by these machines was safe, releasing less than 10 microREMs of radiation per screening. This is an amount equivalent to what an airplane passenger might incur after just two or three minutes of flying at cruising altitude. This claim was later debunked. It was revealed that concentrated radiation blasted directly at a person’s body is much more harmful than the random patterns of ionizing radiation sent in all directions from the cosmos and by an airplane’s navigational equipment during flight. Not long after these facts came to light, the TSA came up with a different type of screening technology that it said was safer − the millimeter wave machine. It all seems simple enough, right? Unfortunately, this explanation by the TSA is trite at best, and deliberately misleading at worst. A closer look into millimeter wave technology and the ways in which it affects the human body during an average TSA screening reveals a truth that the government doesn’t want you to know. The doses of electromagnetic radiation emitted by the TSA’s millimeter wave technology machines can cause cancer. What’s Wrong With Millimeter Wave Radiation? The fact that millimeter wave technology is used in the treatment of skin cancer (due to its known skin-heating properties), means it undeniably has an effect on human cells. This heating is a direct result of microwave frequencies entering the skin and inducing a certain level of atomic motion within the cellular structure. This is really just a fancy way of saying that millimeter wave radiation microwaves your skin. Just how much this millimeter wave radiation microwaves your skin is where push comes to shove. But most scientists are in agreement that any amount of radiation poses at least some level of risk. The public deserves to know both this level of risk and what they can do to minimize or eliminate it. Though not ionizing in nature, millimeter wave radiation is still potentially damaging to the human body. A 2012 paper published in the journal Radiation Research admits that the safety of millimeter wave body scanners is “difficult-to-impossible to prove using publicly accessible data.” This means that TSA claims of negligible risk associated with their use represent the opinion of the TSA, and not scientific fact. What we do know is that millimeter waves, which exist in the 30-300 GHz range, cause “multiple biological effects,” according to another study published the same year in the International Journal of Oncology. Though this study looked specifically at millimeter wave radiation in the context of cancer treatment, the morphological effects demonstrated reveal that this supposedly “safe” form of radiation causes cellular change that inhibit cellular growth. Like all other forms of radiation, millimeter waves don’t differentiate between healthy cells and malignant cells. Whatever cells they’re targeted at are the cells they destroy. 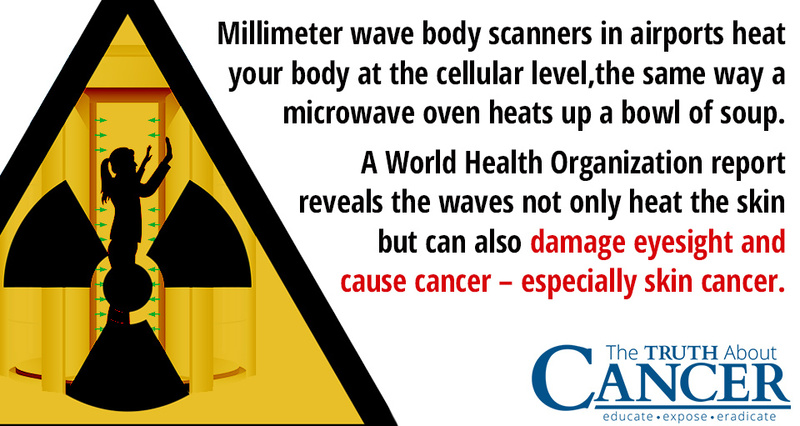 In the case of concentrated radiation blasts from millimeter wave body scanners, it means every cell on the surface of your body. What this all means is that millimeter wave body scanners act as giant microwaves that literally heat travelers’ bodies at the cellular level using ultra-high frequencies not normally found in nature. Microwave ovens operate at nearly the same frequencies as these machines. They induce cellular vibrations strong enough to generate heat in food, so imagine what it’s doing to your skin. But these are just minor thermal effects, you might be thinking, since an airport body scan only lasts a mere two seconds or so as opposed to 30 seconds to a minute to warm a bowl of soup in a microwave oven. But the principle is still the same, especially when taking into account repeated exposures. And you also have to consider the non-thermal effects of millimeter wave radiation, which disrupt cellular communication in ways that science has yet to fully delineate. The United States Air Force conducted its own research into ultra-high frequency, non-ionizing radiation as a potential weapons technology. Interestingly, in the process they uncovered evidence that the non-thermal activity of millimeter wave radiation directly interferes with the body’s ability to protect and heal itself. A World Health Organization (WHO) report adds even more to the conversation, revealing that millimeter waves not only heat the skin but also damage eyesight and cause cancer, particularly cancer of the skin. Recognizing these inherent dangers, the best thing air travelers can do is opt out of the TSA screening process when presented with a body scanner rather than a traditional metal detector. By choosing a manual pat-down, air travelers can minimize their radiation exposure and thus minimize the risk of developing cancer. Though physically invasive and admittedly unconstitutional, a physical pat-down is still better than being blasted with a concentrated vortex of electrical and magnetic energy. As it sweeps around your body, the full body scanner exposes each square centimeter of your body to about 0.013 milliwatts of radiation. Collectively, this is enough to induce gene mutations, nerve damage, sterility, and even cancer. “Low levels (below 10 mW/cm2) of NIR (non-ionizing radiation) have been found to produce many adverse health effects in animals including temporary sterility, genetic changes, and changes in the transmission of nerve impulses,” explains the Foundation for Advancement in Cancer Therapy (FACT). The Transportation Security Administration (TSA) claims their “advanced imaging technology” devices are just as safe as traditional metal detectors. Research shows this isn’t the case and that the doses of electromagnetic radiation emitted by the TSA’s millimeter wave technology machines can cause cancer. Millimeter wave technology is used in the treatment of skin cancer (due to its known skin-heating properties), which means it undeniably has an effect on human cells. Like all other forms of radiation, millimeter waves don’t differentiate between healthy cells and malignant cells. In the case of concentrated radiation blasts from millimeter wave body scanners, it means every cell on the surface of your body is targeted. A World Health Organization (WHO) report revealed that millimeter waves not only heat the skin but also damage eyesight and cause cancer − particularly skin cancer. By choosing a manual pat-down, air travelers can minimize their radiation exposure and thus minimize the risk of developing cancer. 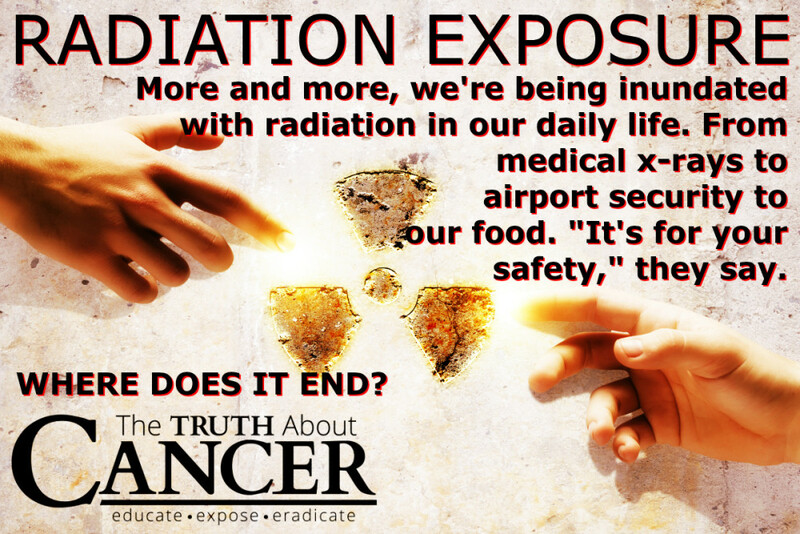 Risks of Exposure to Ionizing and Millimeter-Wave Radiation from Airport Whole-Body Scanners. Millimeter Wave Treatment Induces Apoptosis via Activation of the Mitochondrial-Dependent Pathway in Human Osteosarcoma Cells. While the cosmic radiation you receive in an aircraft at altitude is stronger than what you get on the ground it is radiation that the human race developed with. Not the same stuff as radiation from machines like scanners and cellphones (cordless phones and WiFi routers may be much much worse) and the distinction may seem minor though actually is important. The aircraft systems quite probably radiant more harm than the cosmic radiation will ever do and if the cabin has WiFi you are getting hit hard from that source – these things are not benign. 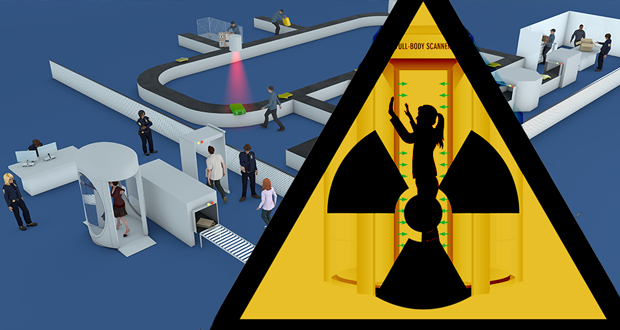 Full body scanners emit radiation like most mechanical devices that is anything but natural and can be very disruptive to the human body which is why we need to limit our exposure – period. Cosmic radiation should not be lumped in with these mechanical sources. Microwave ovens are more powerful than many think, nor are they so well sealed either. I have tested top brands and found the signal at maximum on my equipment for up to 20 feet (6+metres). That is with the door closed and functions normal. Radiating devices can emit what are called ‘side lobes’ of energy and these can be quite powerful too. Even to the back as well so only by careful measurement can the actual radiation be determined. Shielding is a difficult task and expensive. The TSA assured everybody that the first scanners were perfectly safe and it was later found that they were relying on the manufacturer’s tests and these proved to be very questionable. Be very, very careful with ‘official’ claims of safety as some years later they all too often are proved otherwise – far too many to be unintended accidents or mistakes so there is a very long list in almost every field. Got the pat down today after yellow squares showed up, again, on the scanner, for nothing. I felt violated like I was being molested. This is a choice of two evils. Sorry to hear that. No fun. Somehow my uber-hot wife always gets flagged for further insurrection. I wonder why. I flew for the first time in years this week. I opted out of the scans, and into deliberately very public pat-downs (my choice), to make everyone as embarrassed as possible. Handsy lugs can’t give me cancer. I opted for the public pat-down too but I didn’t find it overly intrusive. What I thought was uncomfortable was when I was directed not to touch any of my belongings, especially after the homeopathic remedies I wrapped in foil triggered an alert on the way home. Funny how no one caught them traveling to my destination. Dear Jessica. Look forwards with positivity not back in fear. What is done is done and the issue is not that a one time event with such a machine is dangerous, and certainly not what a dissenting pregnant woman should be forced to undergo, it is that the benefit, if any for security does not at all out way the repeated exposure of the travelling public to a radiation exposure. The scanners are not justified on many levels. The airport workers who are subjected to repeated daily exposures are the ones at real risk and there is strong suggestion that some are suffering – albeit bullied into silence as they do so. At age 4 1/2 until 5 years I was in hospital with Stills Disease, a relative of Polio and subjected to repeated X-Rays at a time when the machines were crude and powerful enough to blast a city block at each shot and probably did. It could potentially have been extremely harmful later in life in so many ways though fortunately has not been. I am a robust active fit 67 year old after 43 years working as a pilot which exposed me to repeated Cosmic radiation as well as bad air quality, general environmental risks and the nonsense pretending to be security at airports. Do not fear for your son, avoid the scanners if you can and ensure you enhance both your son’s and your own health with knowledge of all the other potential hazards which in total will far out way the risk of the one exposure you both received in the airport scanner. 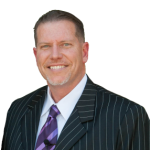 Clearly that you are following Ty’s efforts and the support team he connects you with you are doing a great deal more than most. Well done, be positive and evolve with a strong self confidence. Jessica, I agree with Peter’s comments. A one time exposure should not be a worry. Submitting your son to the CDC schedule of vaccines is much more dangerous! Also, having a WIFI router on in your home 24/7, using a cell phone near your son, having a cell phone on in a car with your son, feeding your son food loaded with pesticides and GMOs and MSG is much more dangerous. 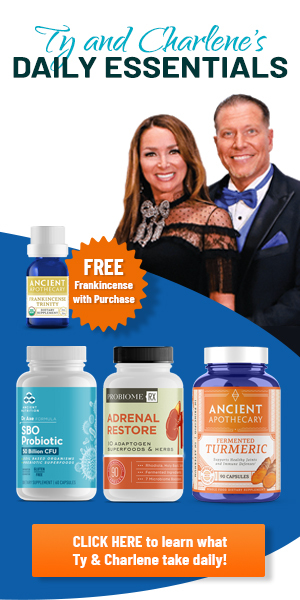 Focus on building and protecting his immune system. Blessings as you continue being the concerned, loving, nurturing parent that you appear to be. I had to do that recently in for high schoolers. My religion, based on the Bible, prohibits us from internally mingling non-human biologically-derived substances with our own, and from ingesting known poisons. Between the Scripture verses and the many prohibited substances that are in the vaccines, it was a long write-up. I have just returned from a 10-day trip to Europe. Currently, I feel extremely worried after learning that the TSA scanning to which I was submitted at DFW, Heathrow, and CDG were actual xray procedures. There were no signs informing us of that and of the fact that it was not mandatory to do what asked, but one could opt for a hazard-free body search instead. I have long hair and a jeweled hairpin triggered the alarm 3 times; I was not aware of it until later — nor concerned that the procedures were not safe to my health. (I have always refused medical xrays, I opt for alternative medicine and natural health lifestyle.) There should be signs in the security area informing people of the real XRAY nature of screenings and the option for body search — but everybody was being sent through the xray machine! This is like being told you will have a shower and having zyklonB poison sprayed on you in a nazi camp! THERE SHOULD BE WARNNGS POSTED to inform innocent passengers — The way there are warnings on cigarettes packages or in markets about mercury fish hazards…. Everyone was being sent through the xray machine from what I saw, I thought it was normal to comply… (The also patted me at CDG because nobody thought it was the hairpin triggering the alarm since the metal part was covered by beads; I have no travel experience – I think security staff should have figured it first thing and spare me the health hazard xray scanning…). I am terrified after having researched indepths about this matter over the past few days. I am now feeling sick especially after finding a small lump on my forearm three days ago and having had stomach issues (unable to hold food) since yesterday. I would like to know if there are other cases like mine — where customers have complained about the lack of TSA health hazard and body-search option informative signs in airports and who have had strange symptoms subsequent to 3-in-a-row TSA scanning — so that I can immediately join their activist work. The policy of “opting out from xrays” is probably not known by most travelers. I am a teacher who has never harmed anyone, there was no reason to go through this health-damaging process. Dear Gabriela, Worry creates a stress response which causes adrenalin and cortisol to surge throughout your blood and organs and muscles.These surging hormones will cause you to feel worse, unless you use them in fight or flight. Many things contribute to balanced health, or ill-balanced health. Feeling terrified doesn’t feel good. As you said, you are now feeling sick. Find a thought that feels ‘better’, and focus on that. Focus on eating organic food, drinking spring water, regular gentle exercise, ample, restful sleep, meditation, and sharing information that will benefit others. Yes, the environment is increasingly toxic. If you use a cell phone and have a WIFI router in your home, you are exposed to more radiation everyday than 3 TSA scans. There is more and more support for reducing exposure to man-made electromagnet radiation. Educate yourself, to reduce your stress, and then educate others, be of service to others; it is the motivation/foundation for effective activism. Everything one does to elevate their consciousness elevates the consciousness of all. your article contradicts itself…in one place, you say millimeter waves are 30-300 gigahertz, and then later you say that the millimeter waves in the TSA scanners are in the terahertz range. Terahertz is over 1000 gigahertz. which is it? they are in the first range. loom up l3 commjbicatikns. they manufacture and sell them. Today I have just been through Heathrow airport and wore a sling to try to avoid the scanner as like Brisbane they will not allow you to opt out for a pat down. I was made to go through even though I had an arm injury. When trying to discuss the dangers to them they threatened to call the police and I would not be allowed to travel on if I kept refusing. After all this they still had to pat me down..I don’t get it! They fall back on the same old argument, “it carries no more radiation than a mobile phone”. I travel a lot for work and it stresses both my husband and I to go through this every time we fly… At least in the US you get an option. I would be interested in a group to lobby for transparency and more information to the public so they could at least have a pat down instead. I have just attended a medical conference in London and we are in for a pandemic of lifestyle diseases…this is not helping!! I asked for Pat Down at EVV airport instead of scanner, TSA employee categorically refused without explanation. I did fill complaint card. I was not happy of this situation,, maybe I should opposed that employee?? Note: i’m An airline employee. How would you all feel if you were forced to walk through these machines every day to be able to get into work? Not knowing our rights, my four year old son and I were flagged to go through the mmw body scanner in London Heathrow, which we objected to, but the officer said that we both must go through, so we reluctantly went through. That was a few days ago and I still can’t get over the guilt of allowing my son to be subject to this without knowing what long term implications there may be. Do you think my son could be harmed from one exposure? It’s been three days and i’m still terribly upset. Previous to our travel, he had also sustained a head injury and had broken skin on his nose. I feel so upset about the whole ordeal. Any advice / insight would be much appreciated. Thanks for writing this article, very informative. Thanks for your reply. I’ll look into seeking expert advice. Besides medical advice what are your thoughts on what happened. Do you or any of the readers here think a one time exposure would likely harm a four year old? Thanks again. Okay. The last two times I traveled, within 48 hours of being home, I got flu like symptoms, nausea and diarrhea!! Second time was worse than first and took a day longer to recover. I haven’t had the flu since going gluten free in over a decade. This is very unusual. My sister has been very sick like this the last few times she has flown? Any one else get flu like symptoms from flying??? This may be worth looking into for you. Perhaps your immune system is weak. Or it could be the airport radiation or nervousness. It would be best to consult with a health professional about this.